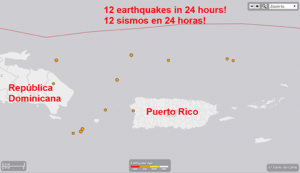 A lot of earthquakes have been reported especially around Puerto Rico and the Dominican Republic today. Fortunately, all were minor between 2.5 and 3.3 degrees, including several aftershocks of yesterday's quake near the Dominican Republic of 5.8 degrees. For months they have been reporting small earthquakes around both islands, but today the number has been somewhat higher. This does not mean that there is a strong one on the way.